Home Costs > How Much Does Caulking Windows Cost? How Much Does Caulking Windows Cost? Caulking windows are important in order to prevent the outside air from entering the house. This caulk will fill the exterior wall of the windows or cracks that serve as a block from the outside environment. If you feel any air coming through your windows, caulking your windows can be the best bang for your buck since it can drastically lower your utility bills. Many contractors or companies can do this and will more than likely charge per window. The cost will depend on the window size, the number of windows and contractor performing the job. On average, most contractors are going to charge about $1.25 to $3 per lineal foot. One story homes will be about $1.50 to $2 per lineal foot, while two-story homes can be double this amount. If you do it on your own, then you will only have to buy window caulk, and this can cost anywhere from $5 to $20, depending on its type and brand. Plan on using one-half of a cartridge of caulk for a double-hung window. By doing it yourself, you can save about 50-60%. According to DIYorNot.com, they claim that it can range anywhere from $50 to do it yourself to as much as $150 for a professional to come in and complete the job. Caulking windows, in general, is an extremely easy job; however, it can be very time consuming and is the reason the job costs can be higher. 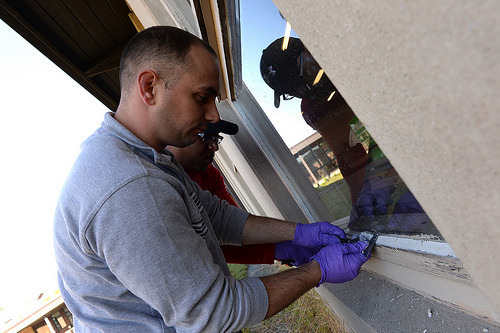 Before the job begins, a contractor will scrape away all of the old caulk around the window by using a special window scraper or utility knife. At this time, they should inspect the areas for any seal leaks around the home. Once removed, the surface will be cleaned and a new layer will be applied using caulk inside a caulking gun. For doors or operable windows, weatherstripping will be used instead. The two most common types of caulk on the market is latex and silicone. Latex caulk is easier to put on and can be painted, while silicone is more durable and is able to withstand extreme temperatures. Caulking compounds can come in aerosol cans, squeeze tubes or ropes for home-based jobs. Doing the job yourself will require a caulk gun, which should cost no more than a few dollars. If you’re going to do the job yourself and you have a two-story home, an outdoor ladder will be required to reach the higher floors. A good ladder can cost anywhere from $150 to $250. Some homeowners hire a professional window cleaner before applying the caulk, especially if permanent dirt spots are noticed. A silicone caulk is recommended because it’s flexible, water resistant and it can last a lot longer than other types. If you want to paint over the caulk, always make sure you purchase one that can be repaintable. The best time to have windows caulked is during the fall when the caulk is able to adhere to the window the best. If the temperatures are too cold, the caulk may not adhere the way you want it to. Low humidity is also important because this can help prevent cracks and swelling while being applied. When hiring a contractor, don’t hire the first one you come across. Instead, consider using contractor comparison tools such as HomeAdvisor.com. Here you can explain your bid and contractors will send you quotes via email.